Maxxis has developed the Supermaxx M6029 tyre using Virtual Intelligent Prototyping and Finite Element Analysis (FEA) - the most advanced computer technology. FEA is used to ensure even load distribution between cornering and straight-line performance. This identifies the stress/load conditions that the maxxis M6029 tyre will be used under, ensuring that even distribution of load is achieved at maximum stress levels under force, whilst achieving a fast and controlled response. 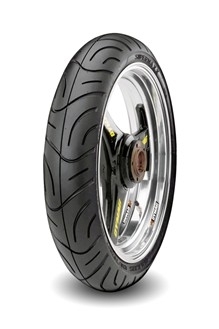 The Maxxis Supermaxx M6029 Touring tyre has a distinctive profile and tread pattern which creates responsive handling and stability for quick and precise cornering. The revolutionary radial construction uses Kevlar belts to ensure tyre uniformity at high speeds.